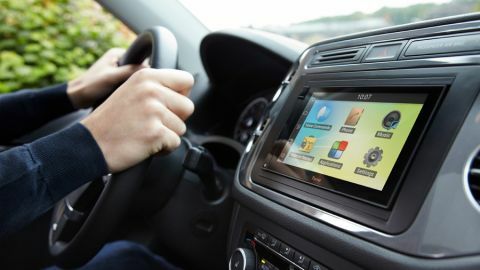 Can Android revolutionise in-car entertainment? If you are looking for a smart option for in-car entertainment that allows you to get and stay connected to the internet while driving, this is a decent option. It's pricey and you may find elements slightly underwhelming, but the Smart has lots of potential. Car manufacturers are racing each other to bring cool technology to in-car entertainment. The catch is that you need to buy a new car to access it. Parrot is one of a handful of after-market companies delivering high-tech entertainment to the car. The Asteroid Smart is a double-din head unit with a twist. Running the 6.2-inch touchscreen in-car entertainment unit is a customised version of Google's Android mobile operating system. This gives the Asteroid system two very distinct advantages. The first is the ability to take advantage of a mobile internet connection - either via a USB dongle, Wi-Fi hotspot or through tethering your smartphone - to deliver online services directly to your car. The second advantage is the ability to download and install apps. That said, there's no Angry Birds on here - but we'll go into more detail about the app marketplace later. The head unit is simplicity itself to look at. The 6.2-inch screen fits rather neatly within the double-din head unit space, and there are finishing bezels to keep things looking nice depending on the make and model of your car. Aside from the touchscreen, there's not a lot in the way of buttons on the display. A power button rests on the bottom left of the screen for manually switching the screen off. Above that, in the top left of the unit, is a little knob that lets you pull a security strip out of the head unit. It's essentially an anti-theft device, albeit a much more convenient one than removing the entire screen. The Smart won't work without it, but it's small enough to put into a pocket and not feel uncomfortable. Hidden away in your glove box is a series of USB connections for different devices, which lets you charge your phone as well as connect an iPod for offline music and podcasts. At the top of your windscreen, there's also a unique double microphone that both captures voice commands and acts as the mic for Bluetooth hands free conversations. For those fortunate enough to drive a car with steering wheel controls, Parrot's Asteroid range can plug in through an adapter. That said, our installer had multiple issues with getting this set up, which was rather frustrating. But once it's all set up, the steering wheel controls give you access to all the main features, like volume, audio select and voice controls. That is, until there's a software update that resets the default mode for the steering wheel controls to off, which as the moment, forces you to manually go in and switch them on again every time you turn on the car. But more on that later.